At ProLight+Sound Frankfurt 2004, hall 8, booth G31, Sound Projects will introduce their line-array concept Linex which taking the technology of the Sigma series symmetrical true line-arrays to another level. Linex sports an 8 driver, horn loaded design in a remarkably compact and light cabinet. The Linex 3-way configuration optimizes full-range output to size ratio maintaining an immaculate sound quality. Carbon-fibre composites together with calculated bracing and other inner reinforcement structures result in higher stiffness and a considerable recuction of weight compared to conventional wooden cabinets. In search of the best line-array physically possible, Sound Projects had already developed the patented HF Wave-shape-transformer. This device resulted in a desired 90 degree horizontal dispersion combined with tight, close to zero degrees, vertical dispersion. Senior designer Frank Zaayer quotes: "If we wanted to go for perfection, the same quality of symmetrical, horizontal dispersion should be delivered by the complementing mid and low frequency drivers. One of the most difficult to obtain performance criteria in a vertically configured stack of loudspeaker systems is stable horizontal imaging." Several combinations of drivers, in just as many different cabinet shapes were developed and thoroughly tested. In order to obtain even horizontal coverage on both sides of the array, SoundProjects went for a symmetrical design of driver positioning. In the mid section 4 specially developed 6,5 inch drivers with a neodymium magnet structure and a stiff, light cone are applied, loaded by diffraction slots. Placed above each other these slots create a seamless vertical ribbon of sound. Due to the small width of the slots, uninterrupted and symmetrical horizontal coverage is achieved. 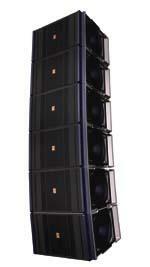 The two long excursion 12 inch woofers were selected for powerful bass performance and are mounted ?side-firing? to enhance the extreme compactness of the system. The design team imposed several other strict demands to the cabinet, mainly related to ease of use, transport and rigging facilities. The intuitive and convenient integrated heavy duty aluminium-alloy hardware allows up to 24 Linex cabinets to be flown safely.